Thermos double wall vacuum insulation technology gives maximum temperature retention, for hot or cold liquids. Previous number 80033. 16 oz Thermos® Stainless Steel Vacuum Travel Tumbler is safe and top quality. Laser engraved to promote your business or group. It is cool-to-the-touch with hot liquids, and sweat-proof with cold liquids. It has the ability to keep drinks hot up to 7 hours and cold up to 18 hours, and a 100% DrinkLock™ leak proof lid. Safe and easy to place into the top rack of your dishwasher. The features include an unbreakable stainless steel interior and exterior. Are you a tea-drinker? See the tea hook that is built in. It holds tea bags or loose leaf infusers. Designed to fit into most automobile cup holders. Works well with single-cup coffee makers. 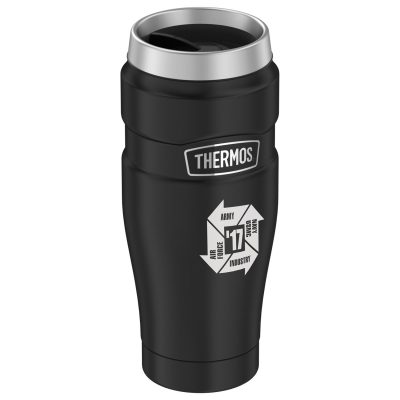 The Thermos brand unbreakable steel tumbler is designed to give you years of reliable service. It is built with quality standards you expect from Thermos®. Colors: Matte Black, Midnight Blue. Cranberry, Matte Stainless. Product size: 8" in height. 2.75" wide. The price includes your imprint in 1 location. Packaging: Case pack. 12 items per case. 8 lbs. Option: 2nd location imprint. Add $2.00 per piece, plus setup charge.